Anyone who has gone abroad to live and study/work for 6 months will be familiar with the temptation to take 6 months worth of your favourite toothpaste.. However it was all new to me. Unfortunately, when I had phoned Virgin Atlantic to ask about the baggage allowance for my flights, the lady on the phone had given me the (much higher) amount for flights to the US. So at the airport I had about 14 kilos too much, for which I was quoted £650.00 to check in. 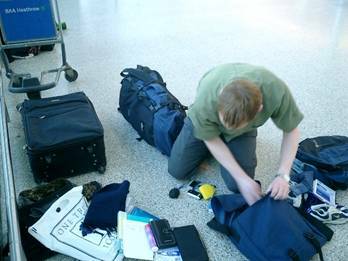 So, the first hour at Heathrow was spent frantically repacking everything I had taken, in order to send one bag as cargo. After checking in and having a last breakfast with Mum, Dad and Elaine, I ran to the gate and was the last person on. 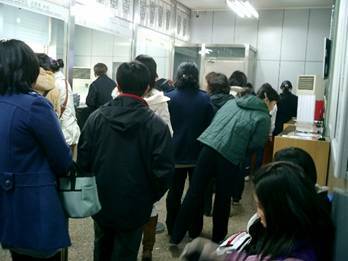 This the queue for the bank, on my first day at BLCU. My Ukrainian ‘liaison’ is standing by the Air-con unit, although she’s not actually dragging her luggage around at this point, since by now I’m holding it instead. 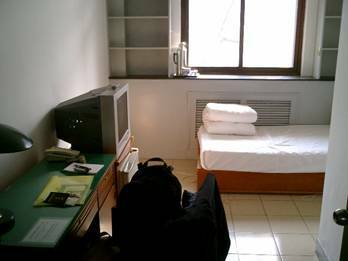 It surprises me that anyone finds this interesting, but this is my accommodation, as it looked on day one. 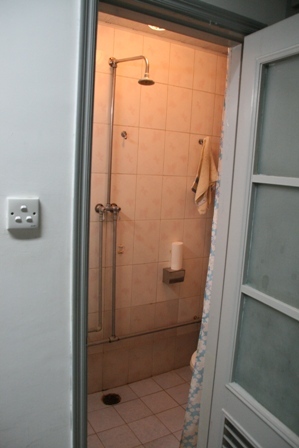 Basic, but it has it all, TV, fridge, shower and toilet, and later to prove essential, air-conditioning. 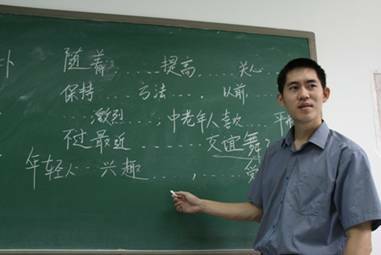 This pic is of Liu laoshi, our oral teacher during class. Good job these guys were on hand. As well as going to class I had a lot of language partners. Four in fact. 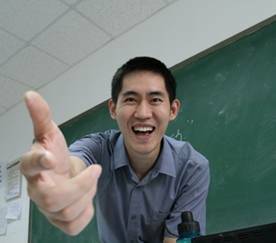 This is Siqian, who helped me a lot. She was doing a PhD in International Relations I think, or maybe that was just her hobby. Anyway, we had a LOT of interesting chats. Some of our Friday activities were a bit more arduous though. 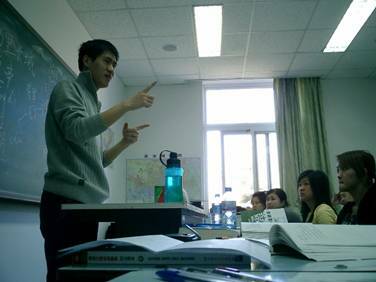 This picture is of me representing the class (along with Huang hua ling) in a speech competition. This was due to my unfortunate ability to pronounce things perfectly, even if I don’t have the faintest idea what I’m talking about. Actually, that just about sums up my experience of learning Chinese… Not like the Japanese and Korean students though. No-one understands what they say, but they eat exams like the HSK for breakfast. 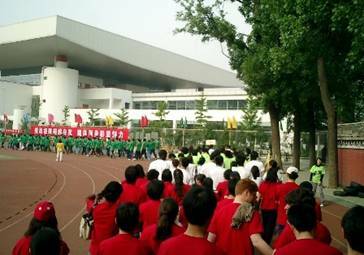 Oh, and we shouldn’t forget the “unwittingly taking part in a political rally” activity, which we took part in on the University Sports Day. We had no-idea what was going on, but it was first thing in the morning (7am) and we were too tired to argue even if we did object. The Chinese took it very seriously though, and after we paraded past a number of invited dignitaries, there were a few speeches, and then all the staff did a kind of mass-gymnastics display. It was at times like this that I realised that all the shops, cars and fancy airports can’t totally erase years of communist history. 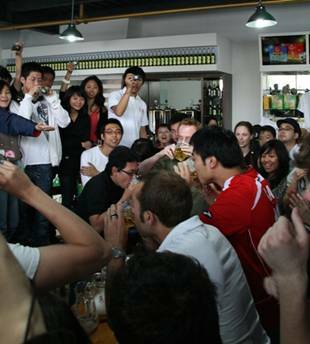 Obviously this single photo of a drinking competition doesn’t do it justice, but our main activity was an all-inclusive 5-day tour of Shandong Province. We were supposed to practice our Chinese I think, but I hadn’t spoken so much English since I arrived. 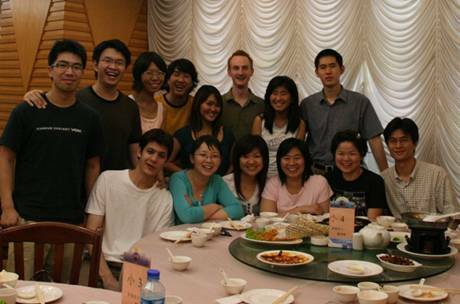 And this was most of the class I think, except a few, at our last officially organised dinner. And our three teachers. On the left is Liu laoshi, our oral teacher, on the right is Zhang laoshi our listening teacher, and in the centre is Chang laoshi, our main teacher who also taught us our all-round comprehension. 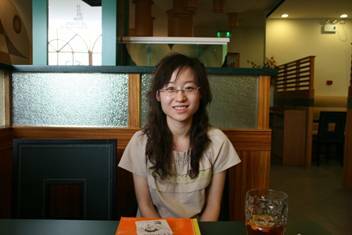 Chang laoshi and Liu laoshi came from Shandong Province, like a lot of the teachers, and Zhang laoshi came from Inner Mongolia. I didn’t know that being used as a propaganda tool could be so much fun. And the pretty one in our class Junly. As well as this nice photo, I couldn’t help noticing how many ridiculous faces she could pull as well. She’ll kill me for this, obviously. If you want to know even more, then I guess you would have to check out the BLCU university website, which has all the important bits in English too. This page is about BLCU, the placement test, the dorms, the programme, and generally how I got on here for one semester in 2008. 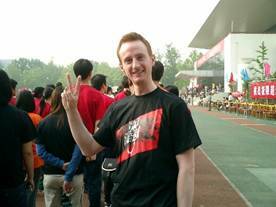 It’s also worth comparing it to my experience of Sichuan University, where I have been for the four years since. When I arrived at BLCU I had studied an evening class for one year in the UK, and travelled for several months in China after that, but I was still basically a beginner. For people like me, therefore, the placement test was fairly rudimentary. We got randomly assigned groups, depending on what we had written in our application, more or less. After we all arrived the teacher gave us a brief introduction to the school, then together with another teacher they invited each student to the front, in turn. We answered some basic questions and then read some text out loud. After each student had their turn, they were then free to go for the day. Needless to say, some of the students were more comfortable with this public speaking, if you like, than others, but that’s how it was. For myself, I was near the end, and anyway I couldn’t care who I talk to most of the time, so I launched into a speech based on what the others had said, and they were impressed. This wasn’t necessarily a good thing, however. 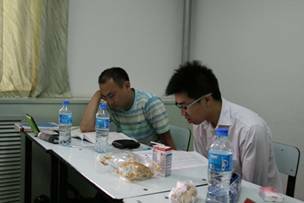 Some of the students were good enough that they were asked to sit an (internal) HSK test the next day. This is necessary for entry into some of the higher groups, apparently. This, due to my bluffing, included me, however inappropriate this turned out to be. I screwed the test up. To show how bad I did, during the listening section I didn’t even know when they had asked a question, let alone what the damn answer was. When I got the marks, several weeks later, it turns out I would have done better in some of the sections if I hadn’t attempted any of the questions and just put ‘A’ for everything. When the results of the placement test came out over that first weekend, I was right where I belonged, in a ‘B’ group, which was one up from absolute beginners. Despite my accidental bluff, therefore, I did end up in exactly the right group. During my time at BLCU, however, I became ‘friends’ with a Ukrainian girl, who was in E3, which is one of the highest levels the school offers. Her Chinese was excellent. Her experience was a bit more formal at the beginning, from what she said. For her there seemed to be more of a panel of teachers who asked questions, and were a bit more rigorous than our more random affair. From memory, I think she also had to do a written test too. Can’t ask her about it now, I lost her email. Damn shame. Naturally, the school was used to handling lots of demanding / pushy Westerners, and their system for dealing with ‘world-class talent’ whose genius wasn’t recognised in the placement process was pretty robust. In the first week, you can request to listen to a different class (for which your original teacher must write out a short slip). After listening to this class, you have the choice to continue, or go back to the original class. There are, however, no other choices. I wondered if this was overkill, for adults, but having studied at a more relaxed university since, I now realise that this was key to providing a stable class from the second week, from which the group could move forward properly. 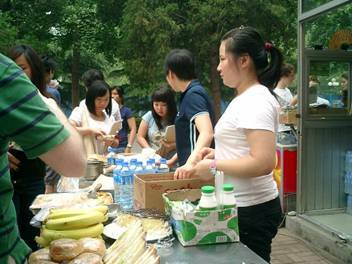 The mucking about every single semester at Sichuan University by (always Europeans and Americans) constantly changing groups is extremely disruptive and I wish they would get it sorted out. But that’s about all the useful info I can think of regarding the placement test at BLCU. A lot of the people who had come on trips organised by a third company (Koreans working for SK, and tons of Indonesians who come through an agent) lived in number 17. I only went inside once, but it was fabulous, although many of the students live with a room-mate. 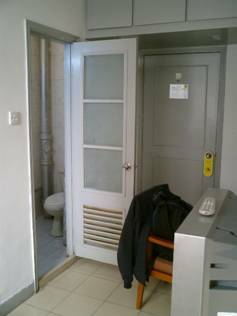 I heard it’s almost impossible to book as an individual though… But frankly, I was quite happy in building number 8, and it cost 90 RMB per day, about the lowest price available for a single room. Below is a picture of my dormitory building from the outside. In the UK they get names, same as the US I guess. However, this one is called Student Dormitory Building Number 8. There is even a big sign on the side with a number 8 on it. I love it. I guess if you were thinking of coming to BLCU, you would want to know… this is building number 8, but most of the softies lived in building number 6, next to the basketball courts, which admittedly was much more posh. Although a lot more difficult to sneak guests in. Below is a picture of the basketball courts. 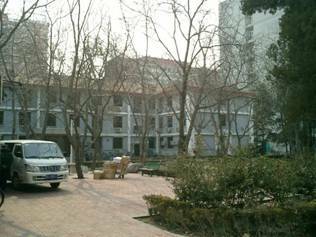 The tall building is crammed with Chinese students, 4 to a room. 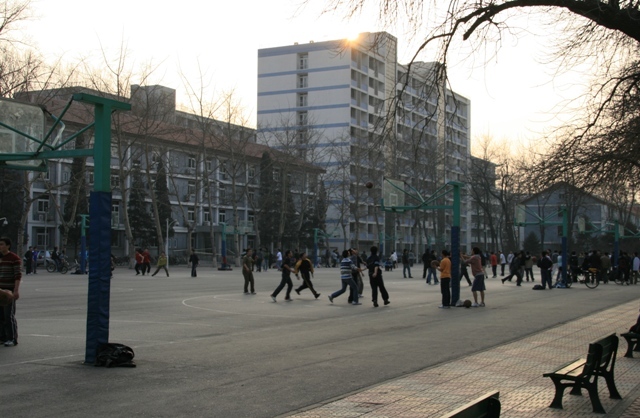 The building to the left next to the courts is building number 6, which was the best one for quality, although people who lived on the north side clearly had to tolerate 24/7 basketball practice. 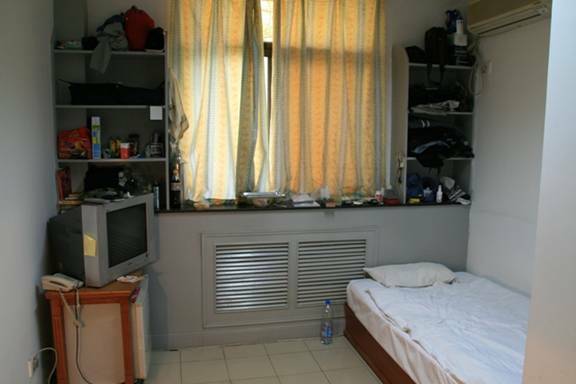 A lot of the google searches ask for pictures of the dorms. 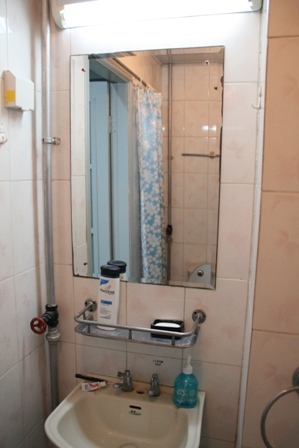 I’m not sure I ever intended to put pictures of the loo up on a website, but hey, might as well since I’ve got them. Whether you’d trust the opinion of a person who photographs the toilets in his dorm in the first place is another matter. This is what it looked like after I got settled in / ruined the place. Note the metal tray on a bowl on the windowsill, which conceals a nicely brewing pot of instant noodles. Why I chose this moment to photograph my room I have no idea. Actually, I do know why I took these, this was the last few moments before I dragged everything out to start packing to go back home. For five months it looked exactly like this though. That towel, now that I look at it, has been washed, I would like to point out. They go that colour very quickly, since Beijing is dry and quite dusty with sand. 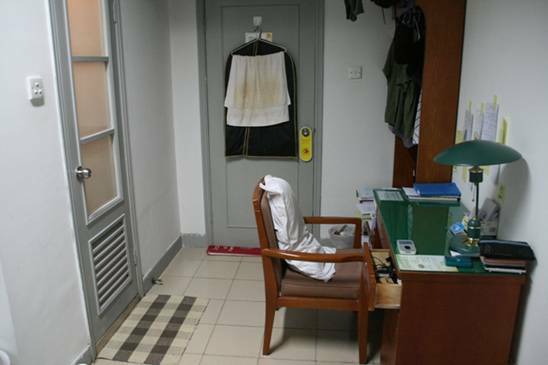 In Sichuan, on the other hand, all your stuff goes the colour of the door in this photo. Remember that when choosing towels to pack. I now know that the BLCU Intensive School (30 hours per week) is a very good evidence-based programme. It’s still, of course, quite ‘Asian’ if I may say. There’s no ‘softly, softly’, ‘must maintain confidence’ by the teacher. Instead, it tends to be a bit more ‘You, stand up, read out what’s on the board’ type of stuff. This takes some getting used to, but it helps with the discipline required to learn the Characters. For this, of course, discipline is certainly needed. 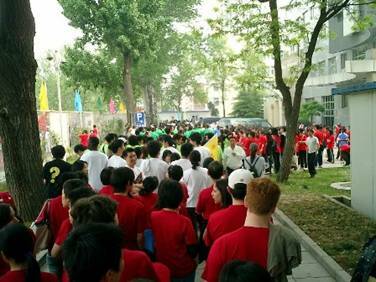 My comparison is Sichuan University (SCU). 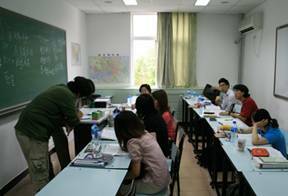 In SCU the teachers are more relaxed about homework, and less likely to lecture foreigners about how fabulous China is. But in other ways they can be more old-fashioned, in that they can be tempted to talk for an hour-and-a-half without a single student saying anything. This wasn’t the case at BLCU, but which you prefer probably depends on your personality. Or your nationality. Koreans love listening for an hour-and-a-half. I should make it clear that all this relates to the Intensive (30 hour per week) programme at BLCU. There is also the ‘Normal’ programme, which is cheaper and slower, but all of the best teachers, the best equipment, not to mention the best students, were all at the Intensive School. If you are short of cash, forget it, but if not, I can’t see why you’d go anywhere else. Applying was quite easy I thought. I needed to wire some money from my bank to cover the cost of the application fee, but then they posted the forms necessary for my visa via EMS, the Chinese High-Speed Postal Service, which was fine. This was the only ‘hard copy’ transaction, and the rest could be done via email I seem to remember. 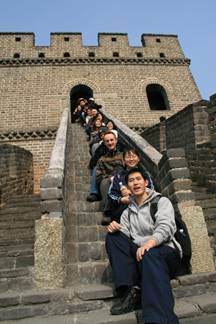 Visa arrangements are yet another story, however, especially if you live off campus (you need to register at the local police station, and pray to God it’s not busy) or if you stay for longer than a year (you must complete a compulsory Health Check inside China at the approved Hospital). Maybe one day I’ll write a separate page on it. Essentially, live in the dorms for the first semester and you’ll be fine. 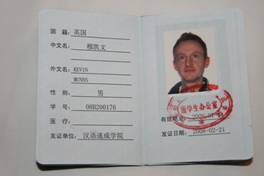 Landlords won’t give you a contract for less than a year anyway, and you can forget subletting, as you need the landlords ID card number and Chinese name so you can register your place of residence otherwise you can’t extend your visa. The Dorms it is then. The only thing I didn’t do was book my accommodation beforehand. I didn’t really need to though, as on the 20 week course we were the first students there anyway, so the place was still pretty empty. Might be different for the shorter courses though, and worth checking out. What I certainly didn’t do, however, was arrive at the accommodation office with all my luggage after a 14 hour flight. I booked into a hotel a few days before, and got some damn sleep. The students from countries that couldn’t afford some spare World Reserve currency however, certainly did do this (including my ‘social acquaintance’ from the Ukraine), and all you need to imagine is Bruce Willis at the end of a Die Hard movie to get the picture. That’s what anyone would look like after they dragged one year’s worth of shampoo etc from the admin office, to the bank, back to the admin office, to the accommodation office, back to the bank, back to the accommodation office and then finally to your new room. No, there isn’t any toilet paper. Nuff said. 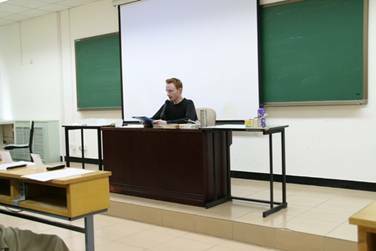 Costs change all the time, and can be looked up easily, but essentially I paid just under 20,000 RMB for the school fee for the semester, and about 13,000 for the accommodation. This seems incredible to me now, but that’s the going rate in Beijing, again, for the Intensive Programme. 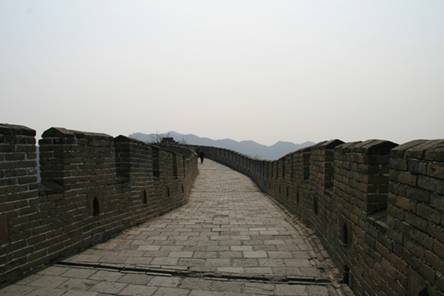 I spent about 100 RMB per day on bits and bobs, food, drink, breakfast cereal, and frankly I can’t remember what else. Needless to say, even a bit of World Reserve Currency in the bank can go down quicker than you think. As it looked on Day 1. Didn’t stay this tidy for long though, as I hadn’t moved in at this point, I was still staying at some nice hotel on the other side of town while I got over the jet-lag. And that was the end of that. I might have burned some cash on my first long stay in China, but I’ve certainly never regretted it. 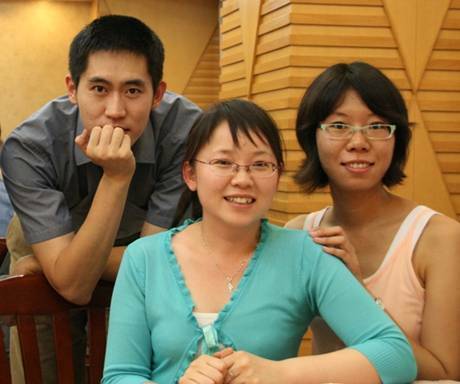 And I’m still in touch with Liu Laoshi, on the left above.